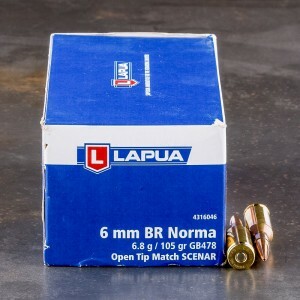 6.5mm - 284 NORMA ammo is an interesting round with a very interesting history. The round was initially developed as a wildcat cartridge. This wildcat was developed by competition shooters looking for a medium bore, soft shooting and accurate round. 6.5 - 284 NORMA utilizes the 284 Winchester as its parent case and necks the case down to accept the 6.5 mm projectile. The 284 case is rather wide and allows for shooters and manufacturers to experiment with case capacity, and shaping different powder columns. The lighter 6.5 mm bullet could still fire a round similar in weight to the 284 Winchester, but with softer recoil. The round’s long distance accuracy has made it a favorite among long range competition shooters. The round has excellent accuracy at the 1,000 yard range and has been a favorite for some time. The round is sufficient for hunting purposes, and its long range performance allows it to be an excellent plains cartridge.